You can find out more about Blondie's exploits on the Wikipedia entry about Operation Frankton - click here. The plaque was unveiled by Lord Paddy Ashdown, in front of over 100 people who gathered outside his family home in Catherington. Although Blondie died in 1987, his memory lives on strongly through his family and friends - those who knew him and served with him. And thanks to the current owners of his house and those who have supported the project and raised the funds for the plaque his heroic efforts and those of his comrades will be remembered for many years to come. 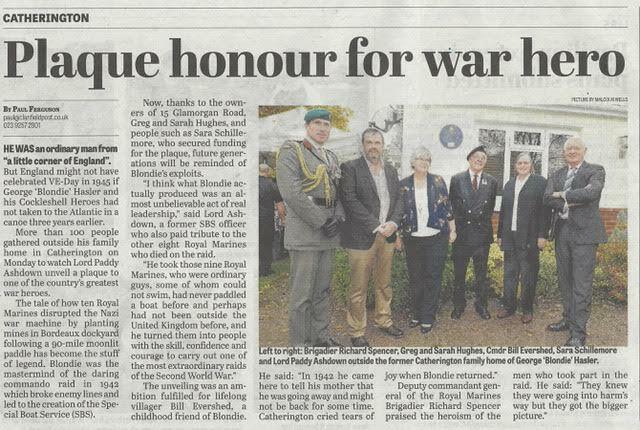 We were really pleased to have been sent this information - it's very rewarding to see where and how our plaques are displayed and unveiled, particularly when they mark such important events.